A #1 New York Times bestselling phenomenon, this deliciously funny read-aloud from the creators of Robo-Sauce and Secret Pizza Party will make you laugh until spicy salsa comes out of your nose. Dragons love tacos. They love chicken tacos, beef tacos, great big tacos, and teeny tiny tacos. So if you want to lure a bunch of dragons to your party, you should definitely serve tacos. Buckets and buckets of tacos. Unfortunately, where there are tacos, there is also salsa. And if a dragon accidentally eats spicy salsa . . . oh, boy. You're in red-hot trouble. The award-winning team of Adam Rubin and Daniel Salmieri has created an unforgettable tale of new friends and the perfect snack. 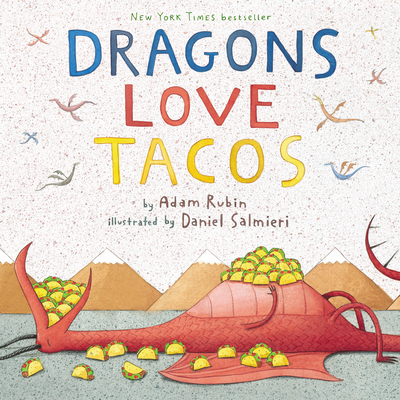 Adam Rubin and Daniel Salmieri are the creators of the New York Times bestselling Robo-Sauce and Secret Pizza Party. Adam lives in New York, New York, and Daniel lives in Brooklyn, New York.